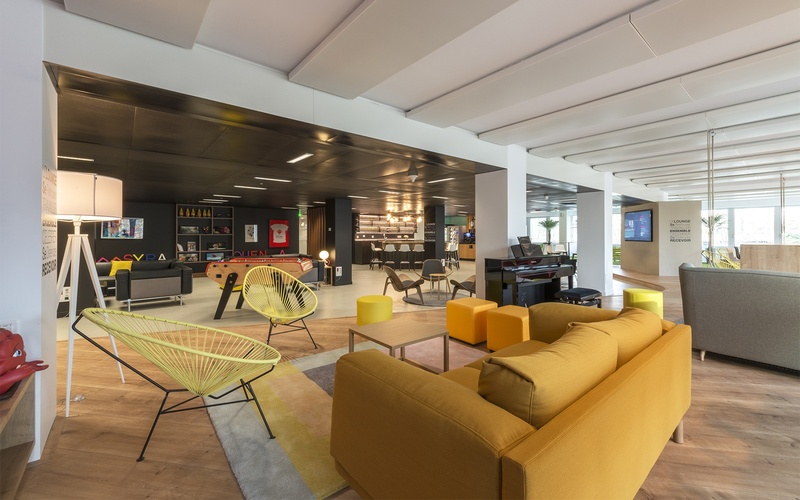 Located in the New Time building on the Ile de la Jatte in Neuilly-sur-Seine, the new group offices of soft drink brand Orangina-Schweppes bring together 350 employees from several different locations into a single space spread over more than 5700 square metres. To create the interiors, the group called on design firm CD&B, specialists in the design of workplaces, asking them to meet the specifications “daring” and “impertinence on 5700 square metres”. Just like the group’s brands, the offices are colourful and festive, encouraging collaboration and teamwork, bringing together people and decompartmentalising spaces. 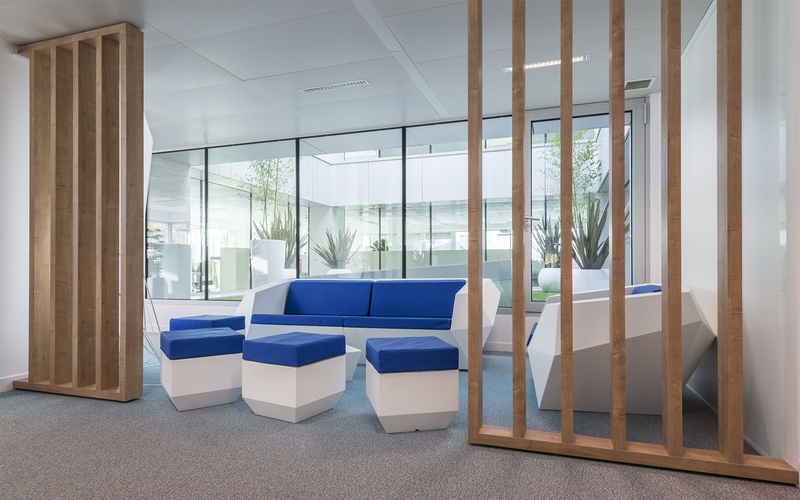 True to its products, Orangina-Schweppes wished to provide its employees with sparkling offices in acid colours. The company also wanted the premises to be as functional as possible with 35 meeting rooms and collaborative spaces with varied atmospheres and original names such as the “Penelope Cruz Room”, the “Uma Thurman Room” and the “Ramon Tafraise Room”, named after one of the mascots for their Oasis brand. 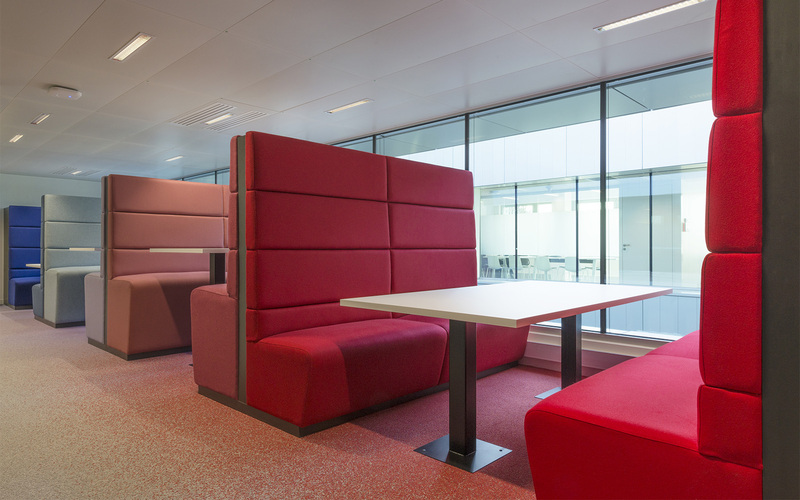 A large 340 square metre lounge area also allows employees to meet informally or simply take time out to relax. 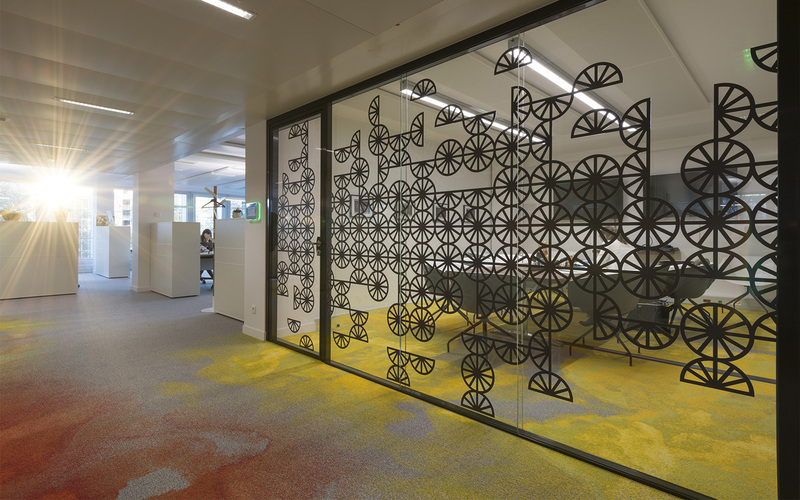 Both timber flooring and a multitude of carpet designs are used throughout the fit-out to delineate areas, while the carpets also provide much of the colour and sparkle to the design. Carpets with subtle bubble and fizzing designs allude to the brand’s products, while others are in neutral tones and solid, bold brights. In one large meeting room, a carpet in tones of grey is crossed with bright yellow stripes like a level crossing. In another casual meeting area, a meeting table is delineated with a rug in a black and white zigzag pattern while a lounge area is delineated by a graphic black and white rug set on blue carpet. Yet another conference room features large square carpet tiles in black, white and green while a break-out area has carpet in grass green with white lines for a relaxing game of mini-soccer, boulles or laying down in the ’grass’. With bold artwork, citrus toned furnishings and over-sized lamps, the Paris offices of Orangina-Schweppes most certainly ‘pop’. Use custom carpet and carpet tiles to allude to a company’s product lines through colour choice and abstract patterns. Vary up carpet designs to delineate different areas and spaces for different purposes. Use mid-tone colours to camouflage daily soil build-up in high traffic areas. Use carpet in conference rooms and desk areas for its acoustic properties and confine hard flooring to areas with low noise levels.